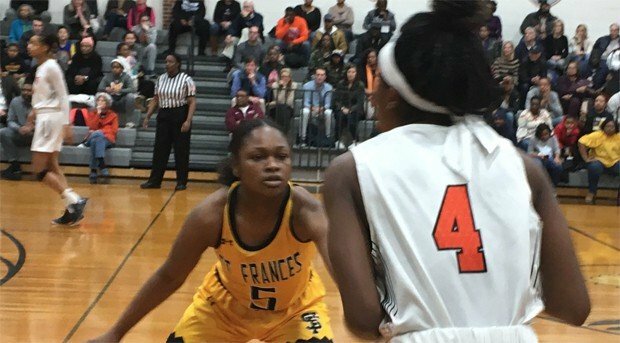 McDonogh School girls basketball had all the momentum it needed after putting together a 16-1 run bridging the the third and fourth quarters to take a 36-35 advantage over second-ranked St. Frances Academy on Friday night in a key IAAM A Conference game. What the No. 3 Eagles didn’t have down the stretch was enough left in the tank to secure a victory that could have given them home-court advantage through the semifinal round of the playoffs that begin next week. Instead, the Panthers showed their mettle from the free-throw line in the late going, converting 10 of their final 11 tries to prevail, 50-44, while locking up the second seed in the postseason. Junior forward Angel Reese was money in fourth quarter from the line, draining seven of eight foul shots to finish with a team-best 20 points for the three-time reigning IAAM A champ Panthers (18-3 overall, 11-2 IAAM A). “It was really about leadership,” Reese said after a game in which she was double-teamed most of the game with a pair of pesky 5-foot-8 defenders, senior Julia Dorsey and junior Ava Class, taking turns attempting to guard the 6-foot-3 versatile post with 6-foot forward AJ Davis quick to apply help defense. The ploy worked fairly well, considering that Reese was held relatively in check until scoring nine points in the pivotal fourth quarter. The main helper in that regard was sophomore guard Aniya Gourdine, who chipped in with 19 points and was the Panthers’ main offensive threat for the first three quarters of the contest. For McDonogh, Davis carried the offensive load until senior guard Aleah Nelson got going in the second half to score 20 of her game-high 22 points. Davis scored seven consecutive points near the end of the opening period to rally the Eagles (19-5, 10-4 IAAM A) back from an early 13-3 deficit. Unfortunately for McDonogh, its shooters went stone cold in the second quarter as the Panthers built a comfortable 21-12 halftime bulge on a Reese steal-and-finish that preceded Gourdine’s banked 3-pointer and layup. Gourdine hit two more three-pointers in the third quarter and Reese added a finger roll as the lead blossomed to 34-20. That’s when Nelson went to work. St. Frances junior Angel Reese brings the ball up the court against McDonogh. Reese finished with 20 points. The University of Cincinnati commit totaled 10 points during that 16-1 run and later added another long-range bomb to knot the score at 39-all after the Panthers had jumped back on top with just over four minutes left in regulation. A pair of free throws by junior forward Madyson Hinton snapped the deadlock and the Panthers went to snare the victory with poise at the line and tightening up their defense on the last couple of Eagle possessions. Reese said that senior guard Savawn Hughes deserves credit for forcing Nelson to miss what could have been the tying shot in the final seconds. McDonogh coach Brad Rees said that the Eagles’ second-quarter woes led to their demise. St. Frances coach Jerome Shelton knows that the rivals could meet again in a semifinal on Thursday if both win in the quarterfinals on Tuesday. Pictured above: McDonogh senior guard Aleah Nelson, who’s scored a game-high 22 points, is confronted by St. Frances senior guard Savawn Hughes in the Panthers’ 50-44 victory Friday night in Owings Mills. 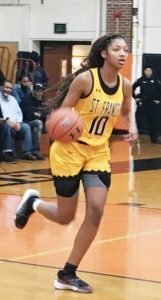 St. Frances – Angel Reese 20, Aniya Gourdine 19, Madyson Hinton 5, Savawn Hughes 5, Anani Humphrey 1. Totals 14 18-28 50. McDonogh School – Aleah Nelson 22, AJ Davis, 18, Nekhu Mitchell 2, Treasure Valdez 2. Totals 15 10-16 44.